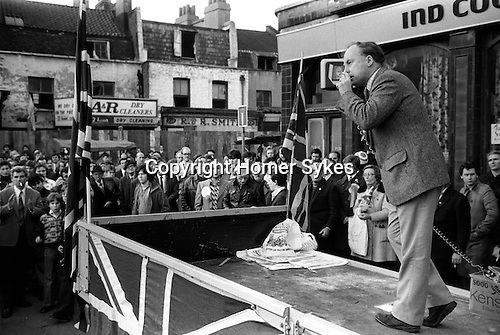 John Tyndall leader of the National Front, a raciest anti-immigration party, drums up support from the back of a lorry, decked out in Union Jack flags at the Saturday Hoxton Street market on 27th November. His audience is almost exclusive male. By the 1979 General Election, the NF was able to field 303 candidates, polling over 191,000 votes, but failed to win a single seat in parliament.